Keep your pets cozy and warm this winter with the Zack and Zoey Nor’easter Dog Blanket Coat in Orange! 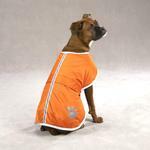 Help pets take a bite out of nasty weather with Zack and Zoey® Nor’easter Blanket Dog Coat in Orange. Each jacket features a reversible waterproof shell, a soft camo print fleece lining and a reflective stripe and paw print detailing. 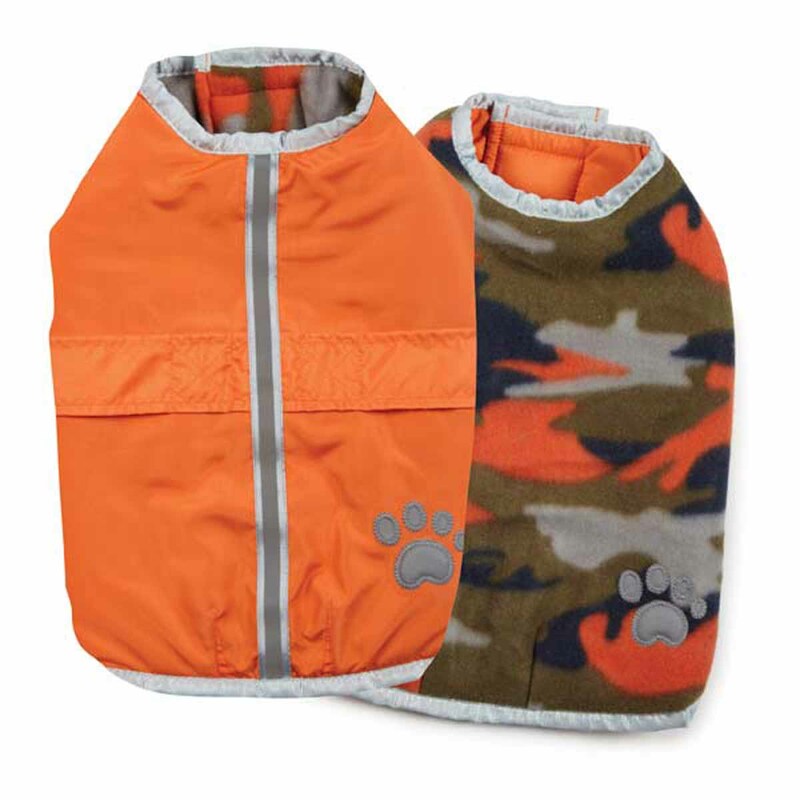 We love this bright orange color and rustic orange camouflage fleece on the reverse side to keep your pet visible. It's a great way to banish the cold-weather blues! Nor'easter Dog Blanket Coat - Orange Customer Photos - Send us your photo! XL Coat fits him perfect 90lbs. 1year old. No one can mistake my Heritage as a Greyhound and Mom chose this wonderful coat for me, I think this color suits me,I'm ready, let's go for my walk. Hope I meet my friends in the park. "Looking at my paw print, it is illuminating"! Allie in a snow/wind storm. She does not like the wind as she was a rescue dog and was abused as a puppy. I think she thinks the wind is going to hit her. She loves her new coat and now we will feel safer while walking at night. I ordered this 1 size bigger than our other ones because it was only 1 left but it still works ok on our mini doxie & can be put over his nice goldpaws fleece vests for double protection! Posted On 11/18/17 by Pamela R from Butler, PA Yes, Pamela R recommends this product! Bought for a Weimaraner and it’s perfect. Color perfect for day and night. Easy dressing her, just attach Velcro. Very pleased. This is wonderful quality. Follow sizing chart for each color and it will fit. Able to use as outer jacket with shirts under it for colder days. Posted On 03/20/17 by Christy R from Canal Fulton, OH Yes, Christy R recommends this product! Petey, our boxer loves his new coat!!!! Posted On 01/23/17 by Marta from Half Moon Bay, CA Yes, Marta recommends this product! My dog has deformed front legs, so it's hard to find a coat or sweater that works for him. The belly strap instead of leg openings made for a perfect fit and the coat doesn't seem to make him feel like he's in a straightjacket. Plus, it's cool-looking. Very well made. Posted On 01/17/17 by Karen M from Depew, NY Yes, Karen M recommends this product! Posted On 01/13/17 by Carrie T from TROY, ID Yes, Carrie T recommends this product! These coats have kept our Mastiffs nice and warm even in 13 degrees below zero! Great product!!! Posted On 01/12/17 by Pamela L from , MI Yes, Pamela L recommends this product! This jacket is the best! Fits well and is long enough to keep my pup nice and warm and dry. Fast delivery, just in time for winter weather! I got this for my smaller dog, it fits in the length, but I had to add some extra Velcro around his chubby belly. Very beautiful color and extra warm. Posted On 12/30/16 by Bill E from Palatine, IL Yes, Bill E recommends this product! Great quality. Easy to put. Keeps my pup warm while looking great. Doubles as an effective raincoat as well. Posted On 12/21/16 by Jo W from cold cold, KS Yes, Jo W recommends this product! The best thing about this warm coat (which is like a horse blanket with the way it has velcro straps under his neck and his belly) is that it is quick to put on an impatient Weimaraner so he is quickly out the door for his business. It is well made, comfy and fits him well! He looks very handsome in it too! We got an XL and it fits just great! Posted On 12/13/16 by Rosa M from Aurora, IL Yes, Rosa M recommends this product! Great coat , I just wish it had one more strap under the leg area. But does keep dog warm and dry. Plus I love the color. This item is exactly what you should expect and it's great! Benny looks great in this coat. It fits well and is easy to put on. Posted On 11/06/16 by Megan P from , NV Yes, Megan P recommends this product! Too cute! I like that this is available in several colors and that it can serve as a coat or a raincoat. My guy is black so it really stands out. Posted On 09/23/16 by Reetz from , NM Yes, Reetz recommends this product! I have 2 large ranch dogs, although they are tough outdoor dogs, they are getting older. We live in an area that snows and gets quite cold in winter and I just want to make sure they are warm at night as they sleep in the garage. These coats are great. They are a high quality product. They are very warm and stylish too. Thank you BaxterBoo for selling a great product at such a reasonable price! Posted On 03/18/16 by Louise B from Richford, VT Yes, Louise B recommends this product! Good product, we are satisfied - I recommend it. Perfect for the Weather lately! Posted On 02/17/16 by Heather S from Chicopee, MA Yes, Heather S recommends this product! I ordered this jacket last week (2/10/16) right before we were to get hit with -20 degree temperatures. I wasn't counting on receiving my order in time for the weekend, but was pleasantly surprised when I got home on Friday 2/12 and my package of goodies was at my door!! PERFECT TIMING!! This jacket fits great!! The only thing I don't like about it is it doesn't have a hole at the top for my puppies harness to poke through for the leash, so I have to use his collar to attach the leash to when I use this. Other than that it is a great coat and has kept my baby nice and warm and dry!! Posted On 01/31/16 by David B from Atlanta, MI Yes, David B recommends this product! Kukla's new coat is of excellent quality and arrived quickly. Blanket Coat attaches quickly with a Velcro straps at neck and chest. Posted On 01/13/16 by Shaw B from Herndon, VA Yes, Shaw B recommends this product! Jaxon is a red doberman and looks smashing in the orange coat. We also take him to the country and the orange with all the hunters down there add as safety. We are very pleased with it and the day after we got it the weather went down to 24 degrees. Posted On 05/03/15 by Perri S from Marshall, NC Yes, Perri S recommends this product! The coat fits great and my Baby Girl loves it! She just struts every time she wears it! Northeasterner LOVES his Nor'easter coat! Posted On 03/23/15 by Kimberleigh E from Brookline, MA Yes, Kimberleigh E recommends this product! Posted On 02/04/15 by BD from Clyde, TX Yes, BD recommends this product! I ordered the XL in this and it was too small for my Rhodesian Ridgeback, but the 2XL engulfs him. It works great for my little Morkie though. Posted On 01/13/15 by Becky from Harrison, AR Yes, Becky recommends this product! Our Winters can get close to zero and often sub-zero with wind chill. Normally, my Aussie doesn't require a coat, but he is a very active dog that likes to be outside. He is able to stay out all day in frigid temperatures and can run, jump and do his normal Aussie acrobatics without the coat falling off. He is about 60 lbs and really puts this coat through the ringer. It launders very well and is made of high-quality materials. I am extremely happy with the purchase of the X-Large for this particular breed. Posted On 01/03/15 by Mirela S from , GA Yes, Mirela S recommends this product! fits very well! Very good quality, and show up in time! Fits well for my BMW X3. Thank You! Posted On 12/17/14 by Nancy G from Three Rivers, MI Yes, Nancy G recommends this product! Good quality - my only concern is if it will fit a Great Dane! Posted On 11/20/14 by Mom of Male Boxer (70 lbs) from , MN Yes, Mom of Male Boxer (70 lbs) recommends this product! My pup is a 70 lbs Male Boxer who is originally from CA and refuses to get used to our MN winters :) I get him a new jacket almost each year as he wears it so much (even in the house sometimes). Great quality, fast shipping, packaged well, good company. I purhcased online and have never had an issue. Posted On 11/17/14 by Kristine H from Rockwall, TX Yes, Kristine H recommends this product! AWESOME!! Great quality! :) Highly recommend. Posted On 11/15/14 by Amy W from , SC Yes, Amy W recommends this product! This was a perfect coat for my basset hound. It's hard to find clothes the right length and height appropriate for the short legs. Love the reflective stripe and paw print. Posted On 11/14/14 by Carolyn A from Dayton, VA Yes, Carolyn A recommends this product! We were are very pleased with our purchase. The coat has a nice soft, fleece lining, and the outer surface is bright orange with reflective striping and a decorative paw on the hind end. It will be the perfect coat for our little doggie when we take her out for a walk. She'll be warm and nicely visible at night. It's also very easy to put on and take off. Posted On 11/13/14 by kerri j from beverly, MA Yes, kerri j recommends this product! I love the Nor'easter Dog Blanket Coat, the storm... not so much. The sizing chart helped me to find the perfect fit for my shih tzu Hercules. This product is very well-made. I have no doubt it will keep Herc nice and toasty this long cold coastal winter. He already got some compliments and YES, I recommend this product! It is not only made with quality and practical for small dogs in cold weather but he looks so cute strutting down the street protected from the elements! Posted On 11/05/14 by Connie R from Fort Collins, CO Yes, Connie R recommends this product! I ordered this neat coat for my Mini Schnauzer, Ruger ! He loves to ride on our Polaris RZR, but was getting cold on our last camping trip in our Beautiful Rocky Mountains... I saw this and decided this is just what he needs to keep warm... I got the orange color since our RZR has orange on it and he also wears orange Doggles Mesh Eyewear in Orange....while riding.....He is one sharp looking dog when he rides ! Thanks BaxterBoo for offering such neat products ! Posted On 11/09/13 by Sarah H from Middletown, CT Yes, Sarah H recommends this product! True to size, works well with the hooded sweatshirt. Nonrestrictive and very easy to put on. Looks good and does the job! Posted On 11/08/13 by Diane S from , NC Yes, Diane S recommends this product! This is one of the best coats I've ever purchased for my dogs. It is lined in a fleece that is warm against their body and it is very high quality. Posted On 11/08/13 by JP from , Yes, JP recommends this product! Fits well and looks great on my GSD foster. Posted On 11/07/13 by Katherine F from Idaho Springs, CO Yes, Katherine F recommends this product! This coat is great for running, skijoring or just spending time on the trail in the cold. This coat keeps my dogs comfortable so that we can enjoy the outdoors even when it is cold out. Love the items and price are within my budget for first time pet parent.